Philosoph und Rechtsgelehrter (1583-1645). 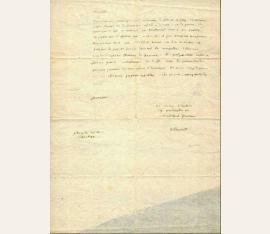 Autograph letter signed ("H. de Groot"). Paris. ½ S. auf Doppelblatt. 4to. Mit eh. Adresse und Siegelspur (Faltbrief). Gerahmt hinter Glas. To the Swabian military leader Christoph Martin von Degenfeld (1599-1653), under whom Grotius's son had served in the Swedish army and to whom Grotius pledges his allegiance: "Nous touts qui sommes icy, moi, les Dames, le filz et la fille remercions vostre Illustrete de la souvenance qu'elle a de nous: et la prions de croire que ce qui a manque au traittement deu a ses qualitez est supple par l'affection qui a este, est, et sera toujours tres sincere [...]". - Degenfeld, who had distinguished himself in Wallenstein's force, later fought for the Swedish side; after the Emperor's victory in 1634, he had to flee to Strasbourg. 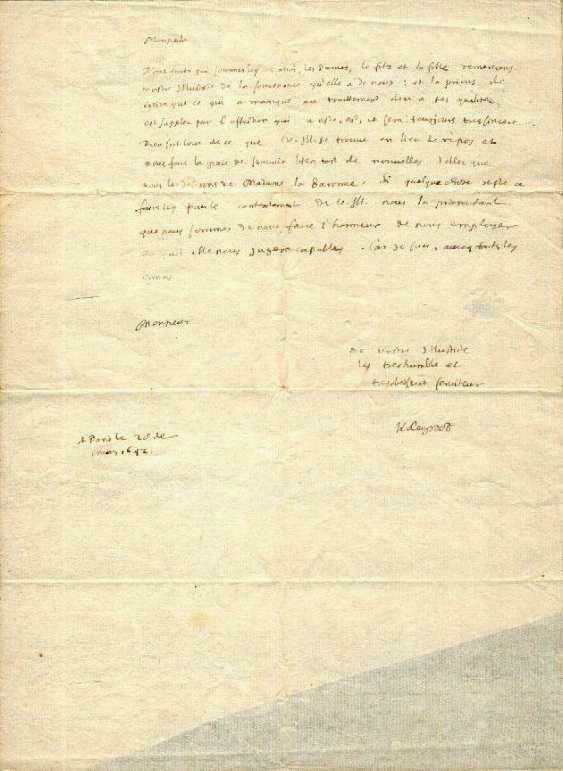 He became High General of foreign cavalry in French services, but fell out with Cardinal Richelieu in the year of this letter and entered Venetian service as Governor-General of Dalmatia and Albania. This is probably Degenfeld's new "lieu de repos" to which Grotius refers in his present letter. 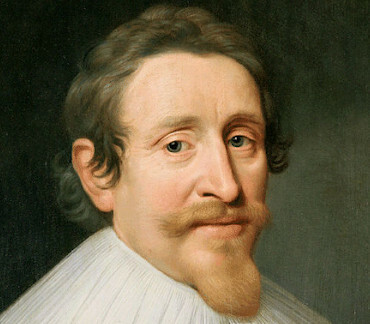 Grotius himself was at the time serving as Swedish ambassador in Paris; his principal work, "De jure belli ac pacis" (1625), laid the foundations for international law. - Letters from Grotius's hand are of the utmost rarity; the present one is the only one established at German auctions since 1950 (Robert Amman collection, Stargardt, 16 Nov. 1961, no. 353)..